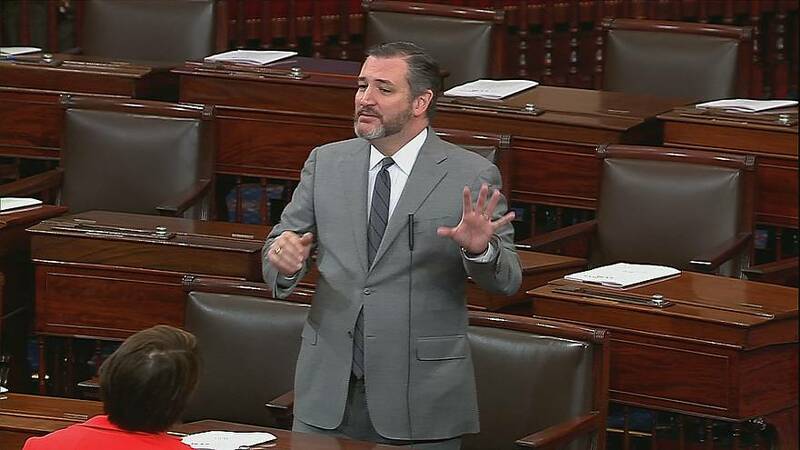 Sen. Ted Cruz, R-Texas, sparred with Sen. Michael Bennet, D-Colo., in a fiery exchange on the Senate floor as lawmakers dueled over reopening the government as the shutdown reached its 34th day. Bennet took to the Senate floor to excoriate Cruz after the Texas lawmaker delivered remarks lamenting unpaid first responders as a result of the shutdown. "These crocodile tears that the Senator from Texas is crying for first responders are too hard for me to take," Bennet said, before he raised his voice in anger. "They're too hard for me to take because when the Senator from Texas shut this government in 2013 my state was flooded, it was underwater people were killed people's houses were destroyed, their small businesses were ruined forever." The 2013 partial federal shutdown lasted 16 days and Cruz notably spearheaded the effort in an attempt to defund Obamacare. Cruz shot back, telling Bennet: "Ok, we get, they hate Donald Trump. If anyone had missed that point, that they really, really, really, don't like this man, their yelling and screaming and bellowing has made that abundantly clear. But just because you hate somebody doesn't mean you should shut the government down." Bennet rejected the accusation that he was screaming at Cruz. "I don't think I was yelling, but I'll go watch the tape, or screaming at you," he said. "I also have never called anybody on this floor a liar, as you did to somebody in 2015 on this floor." Cruz accused Majority Leader Mitch McConnell, R-Ky., of lying to his colleagues after McConnell allegedly promised to allow a vote to renew the charter for the Export-Import Bank in exchange for votes on a trade deal, according to PolitiFact. "We know now that when the majority leader looks us in the eyes and makes an explicit commitment, that he is willing to say things that he knows are false," Cruz said. "That has consequences for how this body operates."